Giving the gift of MAC this holiday season!? Good call! M.A.C. Cosmetics always have fab. gift palettes during the holidays and this year is not exception. 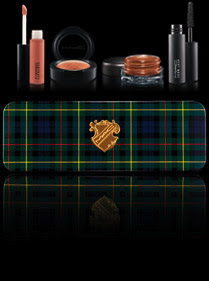 MAC's Tartan Tale Holiday Colour Collection comes in beautiful packaging and has new rich, holiday colors to spice up your makeup this season. The collection features the perfect and budget-friendly eyeshadow, lip, face palettes as well as brushes, nail lacquers and makeup bags. The Tartan Tale collection is a little posh, a little punk, royal and raunchy and a fabulous mixture of patterns and colors. It's edgy Scottish-who knew that was a thing!? It's if Charlotte York in her York-McDoogal days went a little edgy punk with her custom made "Fling" outfit. 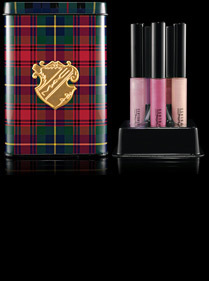 For a limited time MAC wants your gift-giving to look as posh, punk and poetic as their collection looks. They're offering bonny bags adorned by a golden M.A.C. crest tag and tied with a patent leather bow. Enter promo code MACWRAP between now and January 4, 2011! Enjoy free shipping if you buy on their website between now and December 12th. No promo code needed! If you're loved ones are big MAC fans like me, you'll take advantage of these awesome offers now! Enjoy! !